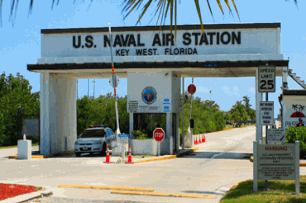 Key West NAS is the conveniently brief name for Naval Air Station Key West. This is the military after all, so they like to have two names for all their top secret stuff. NAS Key West is of course a military base down in the Florida Keys, and like so many such bases scattered around the world, this one provides the perfect conditions for the training, upkeep and manoeuvres of Americas finest. Nation Air Station Key West is so much more than a military place of work, the station is well more of a community....or family even. Within the following page I will attempt to enlighten, and direct you to the best information that NAS Key West has to offer, so make sure you click through on the many links, that you see scattered throughout the page many of them taking you to official information based sites. Key West is the small island at the absolute tip of America. And when we say the absolute tip of America, a well-known fact is it is actually closer to Cuba than the mainland of America. Being no more than four miles across the residents known as “Conchs” take pride in the manner that they gel so many cultures, ethnicity, wild Key West bars, pure Conch restaurants, and historical sites into one crazy but hugely fun place to visit. So proud are the residents, that they even pronounced the place as a republic back in 1982. Take a look at the airport in key west if you fancy flying into the place, they aren't shy of welcoming you to the Conch Republic in any shape or form. And when you have a place that attracts tourists, artists, writers, and of course simple sun worshipers in the thousands, then I’m sure any naval recruits learning their trade at NAS Key West will have a place to head for when granted shore leave. The command in Key West has been here quite awhile; actually the first records of any military manoeuvres were recorded way back in 1823. When due to the Florida Keys developing quite a reputation for Pirates and other water bound baddies, who loved to wreck havoc in the area, the government decided to spring into action and gain control of the Florida Keys waters. They sent Commodore David Porter, down to the Keys with a rusting old New York steam ferryboat, named the Seagull to stop the pirates in their tracks. And instead of trying to beat the pirates in sea knowledge, and entering into chases around the treacherous reefs found around the Florida Keys, Commodore David Porter came up with a very simple way to bring them to task and stop the piracy. He simply used the power of the ferryboat, and dragged a series of huge sailor manned barges in a long line one after another, and blocked up all the escape routes. So successful was this method that the government decided that a naval presence should stay down at the southernmost point of the mainland of America, and NAS Key West was born. And although the first part of Key West NAS’s history was pretty much a success, it has had somewhat of Chequered past. With a huge presence of boats and staff being stationed at the port during the time of the Civil War, it did a great job of stopping the confederacy from getting much needed supplies for the Union. But later in 1898, when a battleship by the name of the “Maine” was sunk near Havana in Cuba this was the catalyst to start the Spanish American war, and once again every vessel the American Government could get at their disposal was sent down to key West to fight for the cause. But whatever the successes or losses that the military encountered no one was left in any doubt that this Naval base should remain in operation. It had too much to offer, not least the prefect weather that made flying the skies of the Florida Keys the perfect place to train their upcoming pilots. If you think of the film Top Gun starring Tom Cruise then you will get a good idea of the kind of things that go on down at Key West NAS. But we will talk more about that later. Where Is The Key West NAS Base? Although its name has Key West in the title, one of the main things that you should know is that it isn't quite in the “Key West Proper” area of the Keys. If you look on the Florida Keys map you’ll see Boca Chica Key which is the second to last of the main islands. And that is where you will find the Naval Base, so it is pretty much a prime location to be able to fly the 93 miles down to Cuba, or patrol the seas and airspace around the Gulf of Mexico and the Atlantic. And probably even better is that being about four miles outside the real hub of bars and craziness that is Key West, it keeps the dangerous mix of alcohol and huge responsibility of protecting the country at a fair distance. Now if you want to visit NAS Key West then you will need to make your way to MM 8. If you are unsure where MM8 is, then consider that the Overseas Highway which is the main road in and out of the Keys starts in Florida City with MM 127.5 and ends up in Key West at the famous and often stolen sign MM 0. So if the numbers are going anywhere higher than 8, you are going the wrong way and have to turn back south. Look for the ramp sign posted Naval Air Station next right and you have come to the right place. Or better still just click on this link to take you straight to Google maps, whereby simply enter your home address and get detailed directions all the way to NAS Key West.